It might seem counterintuitive to emphasize the past to those with memory disorders, but Alzheimer’s and dementia patients often do best when surrounded with mementos and reminders of things that are familiar. Family photos, heirlooms, and comfort objects like a certain blanket or pair of slippers can do a lot to reduce stress and anxiety for those who struggle with a world that is suddenly frustrating and confusing. But there’s one tool that can have an even bigger impact for memory care patients— the power of music. If you’ve ever heard a hit single you remember from high school, or have been through a bad breakup and know the discomfort of hearing what was once “your song,” or know the comfort of unexpectedly hearing a favorite tune on the radio, you know just how big an impact music can have. The right song can suddenly transport you to times and places years and thousands of miles removed. Music can be a shorthand for who we are and express things we don’t have the words for. And that only becomes more true as we age. Research studies report that Alzheimer’s Patients can benefit from music. There’s a physical explanation for why music can have such a profound effect on seniors with dementia. It has everything to do with how diseases like Alzheimer’s affect the brain. The cortex and hippocampus are areas of the brain most affected by Alzheimer’s, and those are the areas that store new memories, emotions, consciousness, and which interact with the central nervous system. Over time, Alzheimer’s has a wasting result on the whole brain, physically reducing it in size and “tangling” neural networks, making it harder for different areas of the brain to communicate with one another and with the body. But there is one part of the brain that resists this downsizing effect, and that’s the part that responds to music. Some scientists think that humans’ unique propensity for music has become hardwired into our bodies through evolution. However, we ended up this way, the effect music has on the human mind can be found not just in the cerebrum, which directly responds to music, but through almost all the neural networks and areas of the brain. 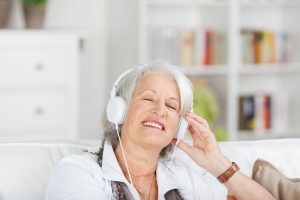 Hearing a familiar, well-loved song not only stimulates the cerebrum, but can trigger a response in parts of the brain tied to memory, emotion, and consciousness— i.e. the exact parts of the brain affected by dementia. While music isn’t a cure for dementia, it can help ease the agitation, frustration, and isolation that can come with diseases like Alzheimer’s. To both the affected and loved ones, it can sometimes seem as if the loved one has departed in some essential way, especially if they are having trouble remembering who family members and old friends are, or are having difficulty finding the words they want to communicate. But music is a way to access parts of a person that might otherwise be put out of reach by chronic illness. There are numerous videos that demonstrate the effect a well-loved song can have on seniors in need of memory care. They begin to speak in detail about the performer, the song lyrics, and their memories of when they listened to such music in the past. When you listen to music with your loved one, it’s an opportunity to engage. Keep your body language open and your questions simple. Make sure there are no background distractions, such as a TV on in the background, a busy restaurant, etc. Let your loved one take in the music, and discuss it afterwards or on a second listen. One of the most important things you can do for your loved one is just show up, be present, and listen. Even those with dementia and Alzheimer’s still have stories to tell. Music can be one helpful prompt, along with mementos, family photos, and more. Other resources that can make care-giving for loved ones with memory impairments easier include a program called Alzheimer’s Caregiver Buddy, which can help you cope with symptoms like wandering, as well as new approaches to routines, hygiene, meals, and keeping up with medications. Best of all, it’s available 24 hours a day with a live listener and coach, toll-free at 1-800-272-3900.